GALVAC™ ION REACTOR 25 replaces the old K-Cationic. 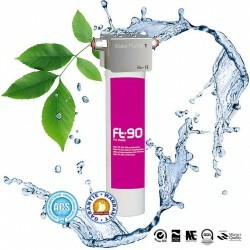 It is up to 10 times more powerful in innovative treatment against oxidation of metal water pipes and the limestone deposit in the equipments. 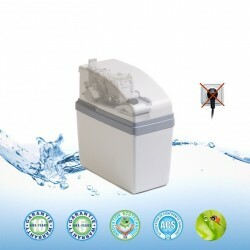 Installation in any position without pressure controller or anti-ram. 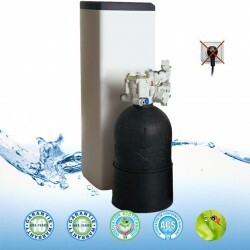 Installation in any position without reducing pressure or anti-ram. The new model GALVAC™ ION REACTOR 25 is indicated for flow rates up to 14000 liters per hour corresponding to the water needs from 5 to 14 people. 10 years guarantee. Free delivery. 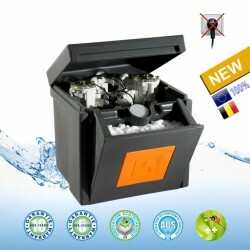 GALVAC™ ION 25 is the second new anti-corrosion descaling ecological reactor designed and manufactured by Aguagreen. The new GALVANIC ION™ REACTOR 25 replaces two old reactor K-Cationic 10. What the new anti-corrosion descaling reactor GALVAC™ ION 25 is it better than the old version K-Cationic? From the start, GALVANIC ION™ REACTOR 25 has five new stages input/output. Galvanic device consists of four successive micro-electrolytic chambers which increase more than ten times the power and efficiency compared to the old K-Cationic reactor. 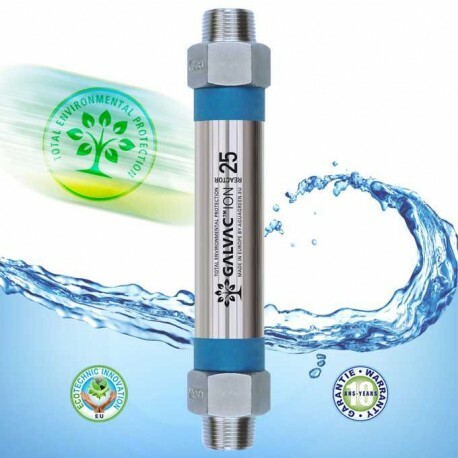 The GALVANIC ION™ 25 reactor is the successful development of anti-corrosion descaling ecological process against oxidation equipment and limescale. GALVAC™ ION 25 requires no maintenance for 10 years minimum. 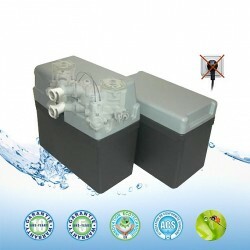 It is the successor to K-Cationic, anti-corrosion descaling very long duration. Only a first check the 11th year. 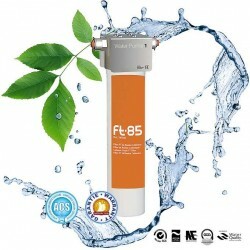 The robust and powerful design envisages a holdover up to 30 years for a pH above 6.8. The reactor GALVAC ION™ 25 is installed in any position without reducing pressure or anti-ram. 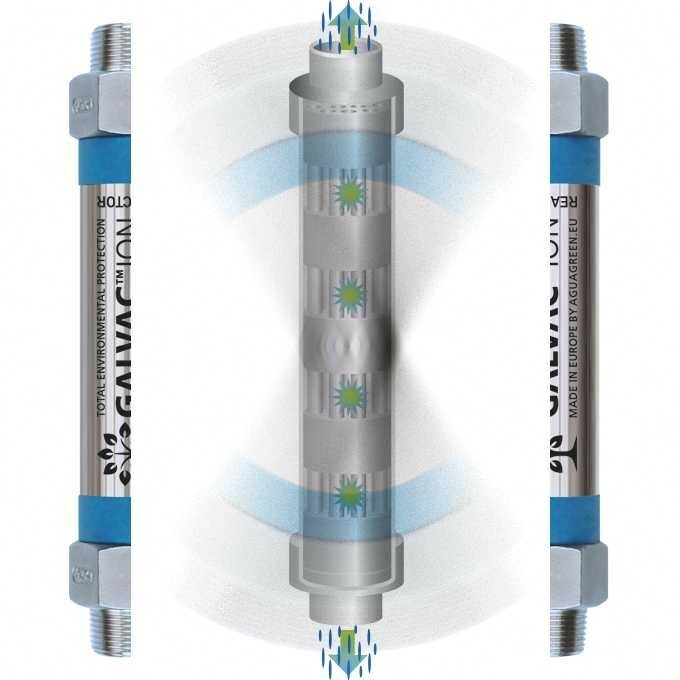 Unlike a conventional water softener, the reactor GALVANIC ION™ 25 is no risk of perforation or rupture of metal pipes as it does not replace the calcium by sodium, but neutralizes encrusting properties of calcium by its transformation in the form of aragonite. 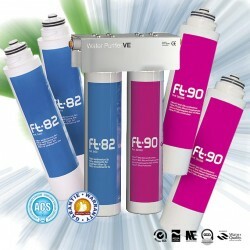 New reactor anti-corrosion descaling ecological GALVANIC ION™ 25 for processing volume of up to 14000 liters per hour. 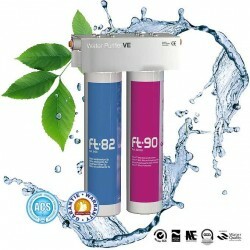 Aguagreen is a symbol of quality solutions in the environmental water treatment. Research and Development of new anti-corrosion descaling range GALVAC™ ION has created the second model GALVAC ION™ 25 which is one of the best environmental alternatives in the natural treatment of the corrosion and descaling. 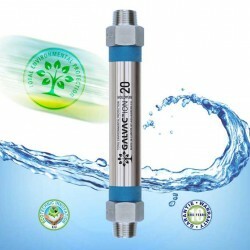 The new reactor GALVANIC™ ION 25 is the preferred choice in the natural treatment of water which, after use, flows into a septic tank or lagoon in the absence of evacuation to public drainage. 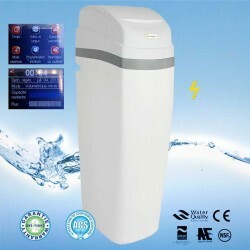 Treatment with a water softener salt is banned, he would kill the good bacteria that purify water. Create a more powerful processing chain with GALVANIC™ ION 25, it is perfectly possible! 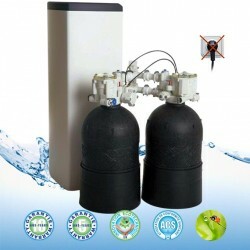 This is one of the great advantages that proposed by Aguagreen: increase the effectiveness of the treatment by simply adding a second, a third or a fourth reactor into the chain. This option will soon be illustrated. Copyright Aguagreen, 2010-2016. Any partial reproduction, altered or processed texts and images without prior authorization will systematically appealed the DMCA then justice.